Competency is a legal term indicating that people “having sufficient ability…possessing the requisite natural or legal qualifications” to engage in some endeavor. As it is overly broad, competency is usually described as having the mental ability and cognitive capabilities required to execute a legally recognized act rationally. Only a judge can determine someone to be incompetent as the Bill of Rights asserts “natural” persons are presumed competent unless “clean and convincing evidence” is submitted to the court. The standard of this is proof, usually presented by licensed health care practitioners. 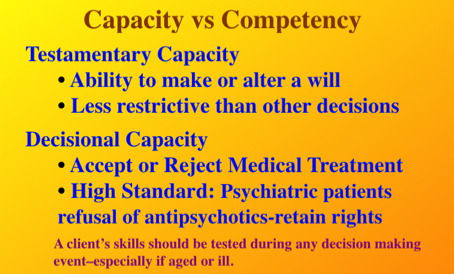 Capacity should not be confused with competency. Capacity is determined by a licensed health care provider, ideally a psychologist or psychiatrist. Capacity who assesses an individual’s psychological abilities to form rational decisions and specifically understand, appreciate and manipulate information so as to form rational decisions. When the health professional finds a lack of capacity to make decisions in some area, this is referred to as de facto incompetent; i.e., incompetent in fact, but not so determined via legal procedure. Requests upon primary care physicians to do such capacity evaluations is increasing and more are refusing as the paperwork is arduous and legal risk high. Research on amyloid buildup, shows that dementia starts 25 years or more before the onset of clinical symptoms, according to Sam Gandy, director of the Center for Cognitive Health at the Mount Sinai School of Medicine in NY. 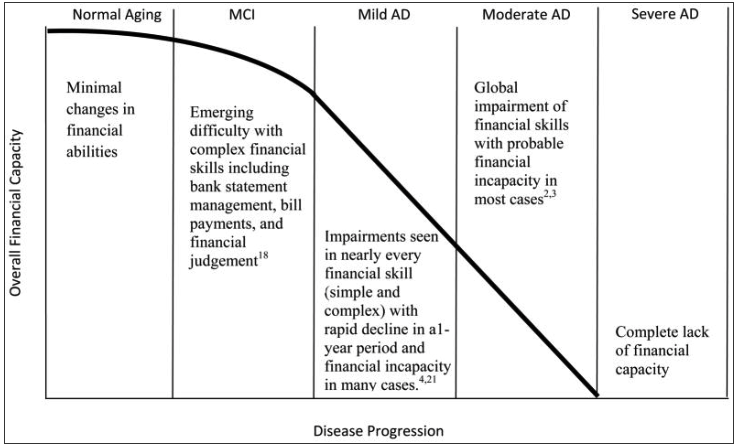 Behavioral signs and symptoms appear later; however, some of the first signs usually seen involve financial problems and susceptibility to “scams.” In fact, over the last 20 years, research has persistently showed that impaired financial capacity is one of the earliest indicators of neurocognitive dysfunction. Among independent activities of daily living (IADLs) such as personal management of transportation, telephone use, medications and finances, a history of decline in ≥ two IADLs predicted dementia ten years later. In particular, difficulty in finances predicted development of dementia ten years before it was formally diagnosed (Pérès et al., 2008). Testamentary Capacity and Consent to Testament guidelines have been promulgated through collaborative efforts between the American Bar Association and the National College of Probate Judges with the American Psychological Association. ** The principles that underlie capacity are not only task specific but also situation specific. For example, the state has to cross a high standard to use antipsychotic medications with involuntarily committed psychiatric patients as they retain the right to refuse medication as long as they pose no risk of harm to self or others. The bar is set much lower to alter a Will. Simply put, assessment of a person’s capacity depends on the complexity of the situation in which she is being asked to appreciate the consequences of her actions. *Impact of Dementia on Capacity to Manage Finances and Prevention of Financial Exploitation. Presentation by Daniel Marson, J.D., Ph.D. Professor of Neurology, Director, Alzheimers Disease Center, Univ of Alabama at Birmingham, March 1, 2012.